Previous Post Thailand is the Wild Wild West. Next Post How to Pack for Thailand! Cheaper than our apartment 😦 Mind you, I couldn't beat the prices of the laundry lady next door. 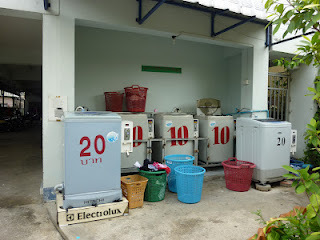 60 Baht for a weeks worth of dirty clothes…priceless. tis cheap, no doubt! i'm super lucky to have my own machine! miss you na ka!